Imagine you’re on Star Wars’ social media team. Representing one of the biggest, most recognizable brands in the world, you’ve gotta be on point all the time. Quick! 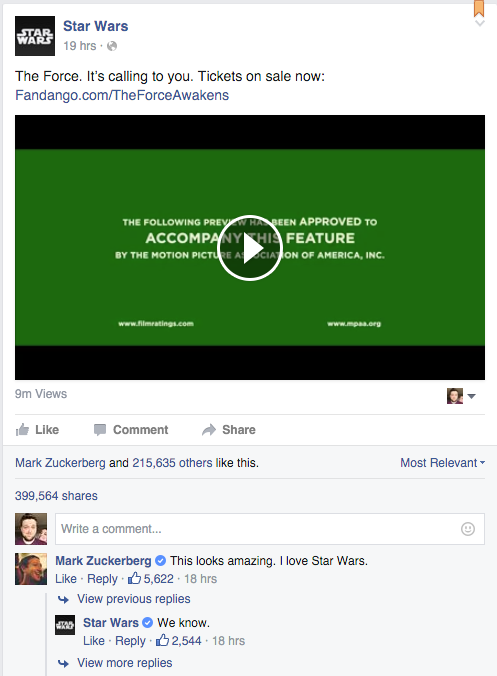 Mark Zuckerberg just said “I love Star Wars.” in response to the new trailer. Don’t mess this up. There is no try. What do you do? How do you reply? A smiley emoji isn’t enough. “Thanks, Mark!” is too generic. No. You drop the perfect reference. Something that makes sense to everyone that reads it, yet makes so much more sense to anyone who grew up watchin’ Star Wars. To anyone who doesn’t care, its an acknowledgement that, yeah, sure everyone loves Star Wars. But to the people who’ve seen Empire a few dozen too many times… it’s the perfect response. Good job, guys. Obi-Wan has taught you well.